In cooperation with the Environment Affairs Directorate and the Mother & Child Welfare Society, under the Patronage of Late Sheika Lulwa Bint Mohammed Al Khalifa a Civil Society Action Program for Recycling in Bahrain was undertaken in 2001. The project was financed by the private sector and supported by UNEP and the environment Affairs Directorate. UNEP provided technical support and guidance. The ladies have now become an independent company, focusing on recycling of all items and providing jobs for Bahraini's. They now employ mostly Bahraini nationals who collect different materials to be recycled from many schools, governmental departments, private companies and individuals. Able to supply recycle skips (at cost) and make arrangements to collect it any frequency you desire. It feels great knowing that, when you give a Heifer gift, you're making a lasting difference. Now it's easier than ever to spread that feeling of pride and joy while helping struggling families. Supports the international programs that need it most. Alfa Express Co. WLL is operating in Bahrain to assist the regional needs of waste management. Their main objective is to venture in a profitable and eco-friendly business to create an easy, hassle free approach to recycling which everyone can get involved in with the ultimate goal of greatly reducing the waste that is needlessly being sent to local landfills and creating an environment we are all proud to live in. Alfa Express Co. WLL believes in business ethics and corporate social responsibility. They are proud to employ handicapped regional workforce. They support regional charitable institutions like Al Bayan and Quran Care that recycle for charity. Together with their expertise and their commitment, they try to do their bit for charity. They have received special recognition from the labor ministry and numerous charitable institutions. They have a fleet of more than 25 trucks plying across Bahrain giving satisfactory services round the clock,7 days a week to the clients for their waste disposal. Alpha Express role is to provide the commercial sector with waste management systems to suit the client’s specific recycling needs. This includes a wide range of bins, containers, cages and compactors. Our standard one point collection service for the recyclables will be provided free of charge. 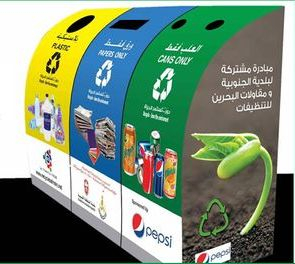 With the support from the commercial sector, the homes will be provided with a suitable recycling bin for the separation of the recyclables. There will be set days for the collection of the recyclables. All you have to do is place the tagged black bags outside your front door as per the provided schedule and they will collect free of charge. With support from the commercial sector, the schools will be provided with suitable internal recycling bins for the separation of all recyclables. An effective one point collection system will be implemented with a regular collection service provided free of charge. They are professional paper and carton collectors, and have more than hundred sites from where they collect. 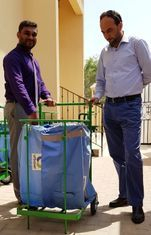 The Bahrain based (Ma'ameer) waste paper recycling unit focused on saving the environment. They collect paper all over Bahrain. While most of their operation rely on collection of free waste paper, they are also open to negotiating to purchase good quality waste paper. UAE based company that has registered to buy plastic and paper in bulk. Bahrain Contract Cleaning is the leading recycling company having 30 years experience in the field. They recycle cartons, paper, all kind of plastic, Styrofoam, etc. They have a contract with Municipalities to participate in their upcoming community recycling projects that is going to create a great impact in the way people think about environment. Having large number fleets and staffs, they currently serve most of the major markets in Bahrain. The only criteria for providing this bin is to find suitable place to serve maximum number of people. * There are no cost involved and it is absolutely free. * Initially we clear these bins on weekly basis and if any point of time the bin get full prior to our service day, anyone call us on our number and we will clear it immediately . * Paper and cardboard will undergo a semi recycling process here in our factory and then export them for final recycling whereas all kind of plastic is fully recycled in our factory in Bahrain and recycled materials become raw materials for many factories in Bahrain. NIDUKKI is a waste management, cleaning and recycling service provider with 30 years’ experience in the Kingdom of Bahrain. Business partners stretch across the island and include both the private and public sectors (Ministries, Industries, Airport, Hotels, Shopping Malls, Private Residential Developments, Hospitals etc). As a leading Waste Management company in the country, they see the push for recycling, firstly as their national duty to protect Bahrain’s environment and secondly as their humanitarian duty to protect the planet’s environment. NIDUKKI started its recycling operations in November 2011 with a facility operational space of approximately 2500 m2. Capable of tackling all pre- segregated recyclable waste. Our recycling operations provide two main advantages to our customers. It assists them with their CSR (Corporate Social Responsibility) commitment through contributing to the protection of Bahrain’s environment and it reduces their waste collection expenses. The creation of our recycling department has been a contributing force to protecting our country’s environment and to our existing customers’ corporate social responsibility. We collect, segregate and recycle all types of cardboard, paper, books, magazines, cans, plastics, cooking oil, engine oil and batteries. We have a skilled workforce that segregates the unwanted waste from the recyclables to ensure that the least amount of waste ends up in the landfill. NIDUKKI offers customized recycling containers (size, design and shape) to meet all clients’ various needs. The Eco-Bus initiative, a community project spearheaded by waste management firm Urbaser, currently covers public school students in the Northern and Southern governorates. Experts visit schools and get the children to board the bus where talks, films and games are held about the importance of preserving the environment. Urbaser’s mission is to improve the living conditions of both present and future generations, ensuring their access to basic natural resources and minimising the environmental impact of human progress. The initiative is being operated under the umbrella of the Education Ministry’s Eco-School Project and was awarded the Best Community Project at the Third Bahrain Sustainable Smart Cities Forum and Awards 2018 which was held in Manama earlier in September 2018. The initiative has so far covered 46 government schools in the Northern and Southern governorates in the last year, which adds up to 10 per cent of public schools in the country. The following are locations where you can drop off recycling check back regularly for updates. and disposed off in an environmentally sound manner and in accordance with national and international regulations. This program also involves the Awali community where a dedicated Awali Recycling Committee has been in place since early 1990. Recycle your Plastic Bottles to help buy Wheelchairs for disabled in Bahrain Don’t Throw It Away!!! It Can Be Used In Some Other Way!!! Drop your empty plastic bottles to Bahrain Association for Parents and Friends of the Disabled located in Adliya opposite Alumni Club (Nadi AlKhaleej). Plastic recycling bin is available in that location. Most supermarkets and shopping area's have carton containers where flat boxes can be deposited. Run by Volunteers and all proceeds go to charities in Bahrain. All donations will be great accepted and can be delivered at the Thrift Shop on the above days during opening time. Special collection arrangements can only be made by calling them. If the Sanctuary is the heart of the BSPCA then the Thrift Shop is its lifeline! The main fundraising for the society goes on day in, day out, week in, week out by a group of dedicated ladies who give up their time voluntarily to run the Shop, which is by far the Society's main source of regular income. The Thrift Shop is the largest in Bahrain and carries used, ethnic, traditional & western clothing as well as children's toys and books, household items and linens, a large selection of books, and many other miscellaneous items. The Thrift Shop is situated in the Busheri Gardens compound just off the Budaiya Highway, opposite the Wholesale Restaurant. Items includes children's , women's and men's clothing, toys, household items, books, etc. Second Chance is situated on the CSBPA's official premises at Tibra's pet store, Budaiya Road, between the Bookcase and the Good Life Gallery. All proceeds from Second Chance will go to help support the Charity Committee in its unwavering efforts to care for stray, abandoned and abused animals. Clean, gently used, seasonal clothing, accessories, shoes, books, toys, linen, towels, household items and appliances, etc. ECC volunteers help sort, shelve items, hang clothing and run the shop. Friday 03:00 p.m. to 05:00 p.m. The Charity Centre is located in the St. Christopher’s Cathedral premises in Manama. The POSA group meets every Tuesday evening at the Parish premises to cater to the needy and the less fortunate of the Parish. The POSA Book Stall; the Thrift Shop and the Parish Canteen are operated under the auspices of the POSA group. The group also counsel and help the needy parishioners at various possible levels. Was started years ago (2002) by Mrs. Salma Bala and a group of like-minded souls. Mrs Bala has also been a prominent member of the Migrant Workers Protection Society (MWPS) and has managed to talk several people out of suicide bids after receiving calls in the middle of the night. Her work has led to her being worshipped by people of all nationalities and was once described as Bahrain’s Mother Teresa. In winter they bring warm clothes, bedding and heaters, and in the summer they distribute water, air-conditioning units and cold drinks. She has also helped hundreds of young maids who find themselves in terrifying situations here, as well as local Bahraini families who are in need. Scores of people and organisations have been inspired by her work and have offered their support. Some have even followed her lead. Two women who used to work with her have started similar projects in Dubai and the US. In Bahrain, dozens of people are motivated to give to the cause. Jawad has a container for batteries recycling neat the entrance of the supermarket. I must also applaud them for the fact that they have made an effort to reduce the plastic waste for dine-in customers by using proper ceramic plates and metal cutlery instead of the plastic plates and utensils that were offered in the past. Zain disposal of old electronics 2011-2012-2015 2018? Zain Bahrain, the most innovative telecom operator in the Kingdom, expanded its successful e-Waste Recycling Campaign with the support of the Supreme Council for Environment, the United Nations Industrial Development Organization (UNIDO), and the United Nations Development Program (UNDP). With an aim to promote a healthy environment and urge people to contribute and participate in the campaign, Zain Bahrain has placed boxes in the UNDP office along with Zain Bahrain’s Headquarters. The company are planning to expand the scope of its environmental CSR initiative by locating boxes in various schools and universities in the Kingdom. Will they restart the project in 2019 and keep it a permanent project?